CIA students pursuing their AOS have the opportunity to complete Cornell University’s School of Hotel Administration program in four to five semesters. You do have to complete your AOS and fulfill the Cornell transfer application requirements. If accepted, you will be awarded transfer credits based on your CIA grades. The School of Hotel Administration has already pre-approved the CIA curriculum in evaluating transfer credits, resulting in an accelerated award of transfer credits to CIA students (50 transfer credits for Culinary Arts or Baking & Pastry Arts graduates). View School of Hotel Administration specific transfer information, request an application interview, or view the collaborative degree program brochure for more details. Is this a guaranteed acceptance to Cornell? Cornell is an Ivy League institution and requires all applicants to meet its standards for admission. You must apply and be accepted into the School of Hotel Administration as a transfer student, at which point you will be eligible for the pre-approved transfer credits outlined in the collaborative degree program, based on your grades at the CIA. Cornell seems very competitive. How will I qualify for the program? As a transfer student, you have had the chance to build additional credentials to strengthen your application to Cornell. You have had work experiences, a history of college level course work, leadership opportunities, and the chance to show a passion for your chosen field. You are also more focused on your short and long term goals than you may have been when you graduated high school. You have the opportunity to show these factors on your application – in your essays, references, responses to questions, and interview – to demonstrate why you would be a good candidate for the School of Hotel Administration. What transfer credits do I receive for my CIA coursework? Can I get additional transfer credits from classes outside the CIA? 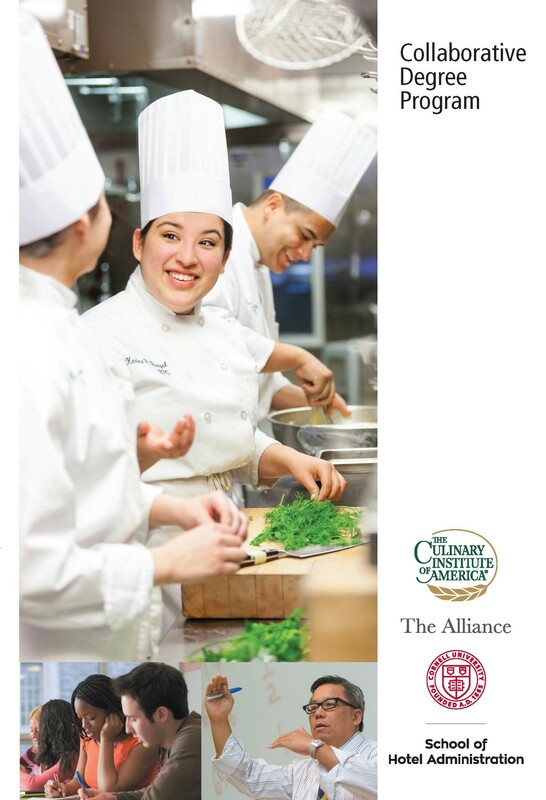 CIA transfer students with an AOS in Culinary Arts or Baking & Pastry Arts receive 50 transfer credits. Additional credits may be accepted, depending on what areas they are in. Review the SHA curriculum and focus your additional studies in areas not covered by the collaborative degree program, such as microeconomics, statistics, accounting or finance. There is no guarantee that additional transfer credit will be granted, and you will need to submit the class syllabus for transfer credit evaluation. What is unique about the School of Hotel Administration program? The intent is for students graduating from the Cornell program to have a broader perspective about the operations and impact of foodservice across the hospitality spectrum. At the School of Hotel Administration, students have the opportunity to learn about restaurant design and development, financing and management, to study foodservice in hotels, resorts, spas, stadiums, institutions and other hospitality settings, and to participate in classes and activities specifically focused on restaurant entrepreneurship. I graduated from the CIA several years ago. Can I be part of the collaborative degree program? Depending on how long ago you graduated, you may be eligible for the majority of the transfer credit awarded to participants in the Collaborative Degree Program. Requests will be handled on a case by case basis. I am an international student. Do I have special application requirements? While Cornell is truly a global university, international applicants are required to be proficient in English. You can find specific application requirements and the necessary TOEFLS or IELTS scores here. I am slotted into the BPS track. What are the requirements to enter the Master of Management in Hospitality (MMH) program at Cornell after I graduate? The MMH is an intensive one year, three semester program. While the MMH program at Cornell does not require applicants to have a hospitality background, it is always an added value, as most applicants have long term goals that are hospitality related. The average age of the applicant is 28 to 30, with three to four years of work experience. The average GMAT score is 628. The more diverse experiences you have had the more you will be able to contribute to the program and consequently, the more you tend to get out of the program. You will be working very closely with your fellow students in discussion groups and on case studies. Sometimes it helps in your decision making to visit the campus, so if you haven’t been to Ithaca, it is a nice trip and you can experience the community, which is relatively small but diverse. The admissions team recommends requesting information online as it adds you to their database and then, even if you decide not to apply to the MMH program immediately, you still receive news and updates. You can find more information and an application at http://www.mmh.cornell.edu/. How much does the MMH program cost? What financing options are available? The MMH program is a one year, three semester program with 2018-2019 tuition at $27, 292 per semester for the three semester program. There are a number of opportunities for financing your graduate education, including veterans benefits, loans, scholarships, and employer assistance. How can I tour the School of Hotel Administration and Cornell? The SC Johnson College of Business (including both the Dyson School and School of Hotel Administration) Undergraduate Admissions information sessions are offered during the academic year, on Mondays and Fridays at 10:15 p.m. While using the online link is preferred to plan your visit, you can reach the Admissions team at 607.255.6376 or sha_admissions@cornell.edu for more information and tour availability. Guided walking tours of the Cornell University campus are also available. Offered by the Information and Referral Center, these tours are available throughout the year, except late December through early January. The tours are an enjoyable and informative introduction to Cornell and its history, student life, and Cornell’s combined roles as an undergraduate teaching institution, an international research university, and New York State’s land-grant institution. Tours begin at the Information and Referral Center in the Day Hall lobby and appointments are not required. The tours are mostly outdoors; each lasts about one hour and 15 minutes and includes information about Cornell’s undergraduate, graduate, and professional schools and colleges. The Information and Referral Center can be reached at 607.254.INFO, Monday- Friday, 8 a.m. – 10 p.m., and Saturday 8 a.m. – 5 p.m. for more information.